If you’re like me, who tends to go overboard in the produce department, then you have probably found yourself throwing out veggies that have gone bad. Even though I do a lot of cooking, I do find myself occasionally throwing stuff out. 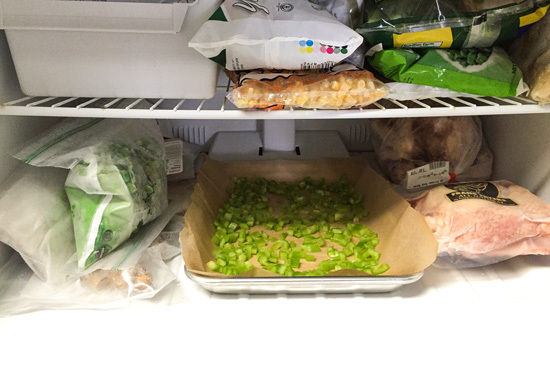 I really hate throwing away food and money, so I’ve been trying to do better about my food waste. 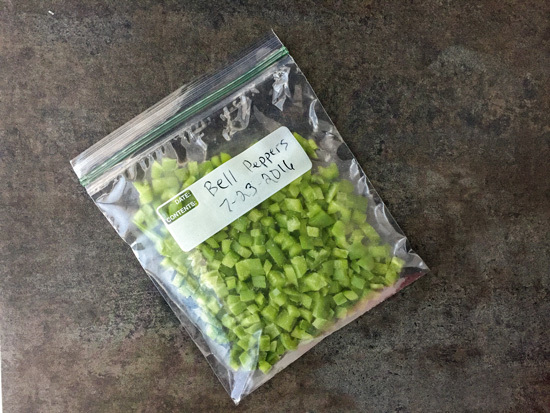 One thing I’ve started to do is freeze bell peppers when it looks like I’m not going to get to them soon enough. I’ve already told you that I have a hard time resisting peppers of any kind when they are looking and smelling particularly good at the store. Yes, I find the smell of peppers hard to resist. I tend to find myself with peppers of some kind in my grocery cart on just about every produce run. The fact that Trader Joe’s only sells their organic bell peppers in a pack of two doesn’t exactly help my problem. Why, TJ’s, why? 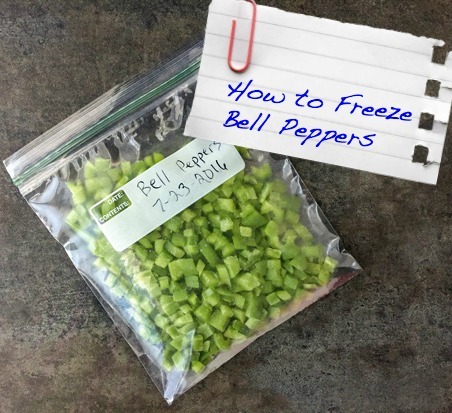 I can’t believe I waited so long to freeze bell peppers. It is SO easy! Seriously, I could slap myself for not doing it sooner. Wash the pepper(s) and completely dry with a paper towel. Cut into strips or whatever size dice you want. 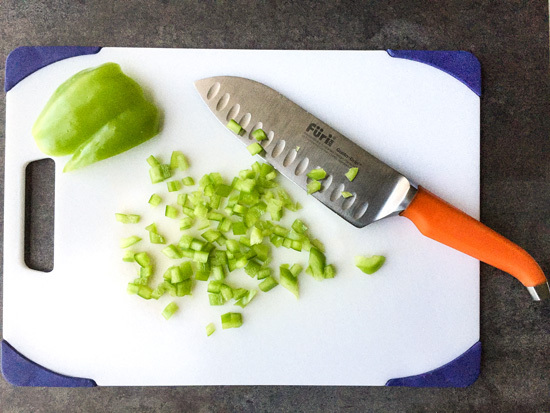 Place onto a baking sheet and spread out in one single layer. I line mine with a piece of parchment paper, but it’s not required. It does make it easy to transfer to a ziploc bag. I just carefully lift each long side of the paper until it’s folded in half. Then, I slide the frozen pieces into a bag. Easy peasy! Most will just slide right into the bag, but if a few have frozen to the paper, just tap on them and they will come off. Hope that makes sense. 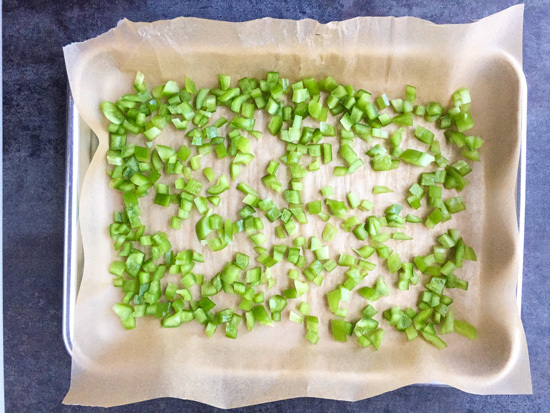 Pop the baking sheet into the freezer for an hour or until the peppers are completely frozen. 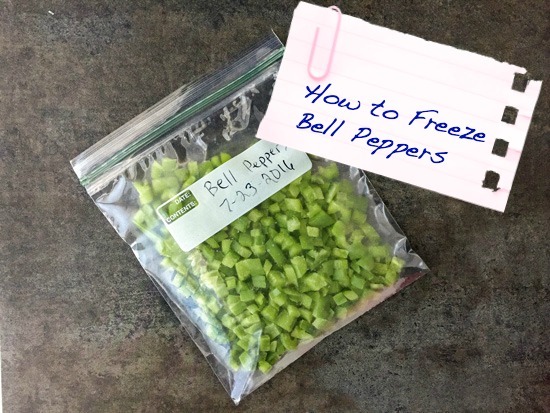 Place into a freezer bag and put back into the freezer. Voila! Bell peppers available whenever you need them! What ways do you use to reduce your own food waste? By Tempie at July 26, 2016 .